April is an extraordinary character in an extraordinary world. As voiced by Marion Cotillard in the animated film April and the Extraordinary world (original title: Avril et le monde truque), she is the offspring of scientists who have gone missing. Her parents conducted their experiments underground because the world they live in is not the same as ours. For one thing the Steam Age is still going strong; for another, the government demands that every scientist work for them. April's parents resist the latter idea. They are endeavoring to discover a formula to make humans invincible to sickness, and when the government finally catches up to them, they make a frantic run for safety that ends up a disaster. Left alone, young April must cope on her own, relying only on her brilliant mind, good instincts for survival, and her lifelong friend Darwin, a talking cat. Obviously, the movie takes place in an alternate universe. The main thread of the story begins in 1931 Paris. April is continuing the failed series of experiments that have haunted her family for generations. Now she has an added motivation: her beloved cat Darwin, her only friend, is dying, a victim of horrible atmospheric conditions in the city, which features two Eiffel Towers, cable-car systems galore cutting through the air, and a toxic residue of coal and steam powered apparatus, which is slowly sickening every living creature. One night, April is shocked to find that she has, apparently, stumbled upon the magical formula! Darwin springs back to life like a newborn kitty, full of healthy power and sass. But she's also come under suspicion by the police, notably the dogged Detective Pizoni, as well as a young man whose motives are shadowy. Like her parents a decade before, she soon is fleeing from the authorities, a journey that will lead to shocking revelations about family members and the truly diabolical forces that threaten the future of mankind. 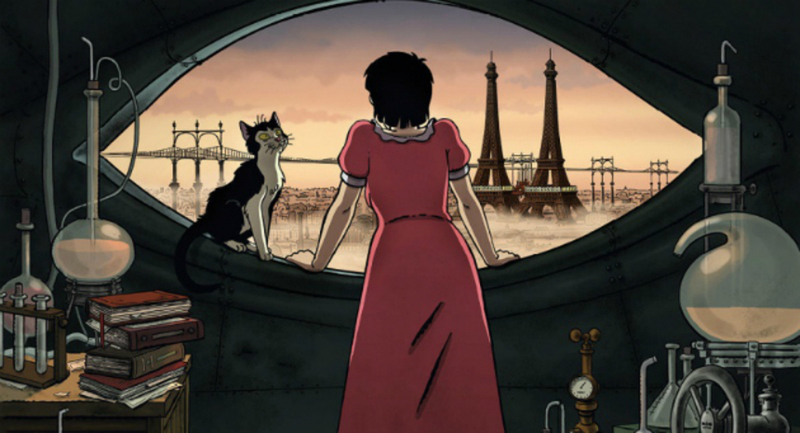 The movie is based upon the work of Jacques Tardi (Adele Blanc-sec), and though I'm not familiar with the French comic artist, it's very obvious that his world is an extremely well-thought out and detailed world, and it's brought beautifully to life by directors Christian Desmares and Franck Ekinci and an incredibly team of movie artists. It's notable that the direct English translation of the original French title is closer to a "tricky" world, giving more sense of the multi-layered mystery of the alternate universe, a world in which not everything is as it seem. Driven by a snappy pace, April and the Extraordinary world flies by but despite everything that's going on, it settles down into a story that's easy to follow and quite fun to explore. In large part, that's because April and her family members, as well as the authorities and adversarial forces that become quite important, are fleshed out well. The characters may be two-dimensional on screen, yet April and her companions keep the fantastical story grounded in the realities of flesh and blood, tears and cheers, drama and comedy. April and the Extraordinary world is truly an extraordinarily stirring entertainment, suitable for all ages. I was a bit torn about this movie. Acts one and two are sheer beauty, and the world they create is a wonder to behold. But act three, with the nonsense involving the poorly drawn alligator-robot people, both looked and felt like something from Saturday morning television from the '70s. Two-thirds of a great movie here; one-third of what, in the days before animation became respectable, anyone over 14 would just have dismissed as "a cartoon."